Bentleigh travelled to Dacland Stadium (George Andrews Reserve) in Dandenong on Saturday night for an enthralling encounter with Dandenong Thunder. 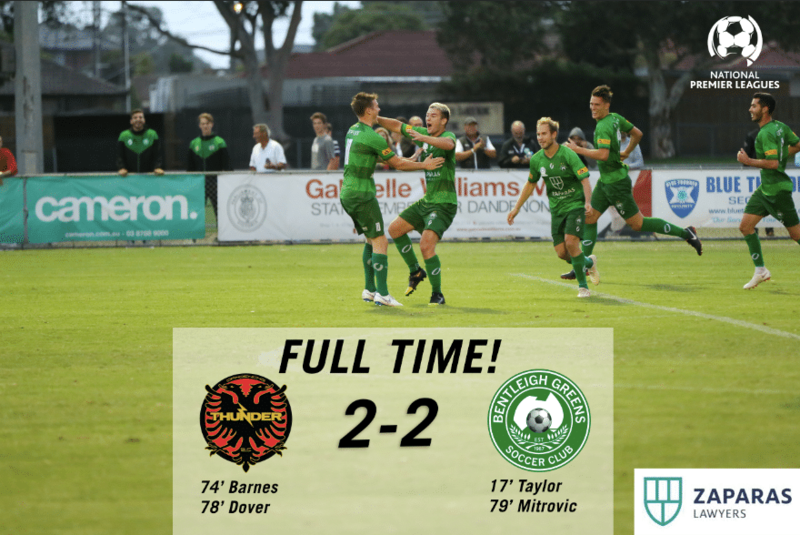 The Greens started the match in fine form creating a barrage of chances in the first 10 minutes but couldn’t capitalise early on. Brandon Barnes had a good opportunity up the other end for Thunder with his effort smashing the upright after turning on the edge of the area. The game’s first goal came on 17 minutes when Brody Taylor snuck his header through a small opening and past Pierce Clark after a Matt Thurtell cut back. The Greens had the ascendancy early however had Goalkeeper Ryan Scott to thank for heading into the break with the lead. On 33 minutes he tipped another Brandon Barnes effort around his left hand post with an amazing diving save. 7 minutes later and Scott had a save of the season contender denying Barnes once again. Scott diving low to his left to deny the English striker for a 3rd time. Bentleigh return home next Friday night to take on local rival Oakleigh Cannons in the derby. Kick off from Kingston Heath Soccer Complex is at 8:15pm.